Smash Bros is a fighting game series unlike any you have ever played. The games allow for 4-way mayhem between human (and computer, if you so desire) players. While stages in other fighting games are simple and flat, and differ solely in scenery and music, Smash Bros offers more dynamic arenas. Every stage has a unique design in terms of size, layout, theme, and obstacles; for this reason, each stage has its own particular advantages and disadvantages. Smash Bros - unlike traditional fighting games that use standard attacking sequences like right quarter turns, half circles, hold `n release, dragon variation and so on - simply uses the and buttons in relation with the joystick, like + . Another distinct difference between Smash Bros and other fighting games is that the point of the game isn�t to beat your opponent senselessly to zero percent life (or to KO them), but instead to raise their damage percentage meter and knock them off the arena. The greater the damage, the higher they fly. While Smash Bros falls short from adhering to the laws of physics or fails to present any sort of a storyline, the games have been top sellers in their respective systems. In fact, Super Smash Bros Melee has been in the top Gamecube seller list ever since its release, and it is still holding strong. In Super Smash Bros, each character has at least two jumps. While all characters have only two jumps, most of them have an additional third jump. However, after you execute a character's third jump, the character will be paralyzed while coming down from the jump. * Kirby actually has a total of 5 normal jumps and an additional + jump. ** While performing your third jump for Pikachu, after the initial , tilt the joy stick in another direction to get another jump (for a total of 4 jumps). Ness doesn't have a direct + third jump; instead, that is his PK Thunder. However, if you steer the PK Thunder into Ness, he will be blasted into the opposite direction. Yoshi has only two jumps. However, his second jump is relatively long and he is not phased from attacks (he can receive damage though). Jigglypuff, like Kirby, has a total of 5 normal jumps; however, Jigglypuff doesn't have an + jump. Also, there is Ness, but he was mentioned in #3 (Note about characters' third jump) above; his third jump is pretty tricky, so read and find out why. To walk, tilt and hold the control stick or . To dash, quickly tap and hold the control stick or . To crouch, tilt and hold the control stick . 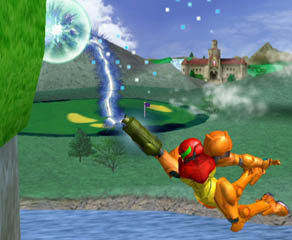 In Super Smash Bros, it is possible to drop through thin platforms. To drop through a platform, quickly tap and hold the control stick . While in the air, it is possible to fall through a platform without having to land on it first. To fall through a platform, quickly tap the control stick in the air. Attacking in this game can simply be accomplished by pressing the or buttons simultaneously with the joy stick ( , , , or ). Grabbing is a very good technique to use while fighting in Super Smash Bros. Grabbing is the only non-blockable attack. After grabbing your opponent, you can choose to either throw them forwards or backwards. The following characters have special grabbing qualities. Blocking is quite simple in Super Smash Bros. To block, press the button. Also, if you want to roll left or right while blocking, press or ; however, you are very vunerable to + type attacks. In this game, your block is quite strong and it can repel most attacks. As your shield gets smaller, you may be more susceptible to attacks. If your shield gets small enough and breaks, then you will become stunned for a few seconds. Jigglypuff is the only character that will automatically fly upwards and out of the arena after breaking its shield. There are several ways to get back on the platform when hanging on the ledge. In Super Smash Bros Melee, each character has at least two jumps. While all characters have only two jumps, most of them have an additional third jump. However, after you execute a character's third jump, they will be paralyzed while coming down from the jump. *-While performing your third jump for Pikachu and Pichu, after the initial , tilt the joy stick in another direction to get another jump (for a total of 4 jumps). **-Peach has a few amazing jumping qualities. First, after you do a single or double jump, hold on to the jump buttons ( , , or ) to make her float in the air. However, if you float on your single jump, then you cannot float on the double jump (on the same jump). In other words, you can only float during one of your jumps. Second, after you perform your third jump, Peach will bring out a parasol and begin floating down. ***-The Ice Climbers are actually two kids that fight together. Now if you lose one of the two, you cannot perform the third jump. The third jump will only work when both climbers are together. ****-Kirby actually has a total of 5 normal jumps and an additional + jump. Also, there is Ness, but he was mentioned in #5 (Note about characters' third jump) above; his third jump is pretty tricky, so read and find out why. Grabbing is a very good technique to use while fighting in Super Smash Bros.
After grabbing your opponent, you can either choose to attack them or throw them forwards, backwards, up, or down. to attack, press ; you can attack for a maximum of two times (three if you are quick) granted that you also want to throw; any more attacks and they will break loose. The following have special grabbing qualities. Samus, Link, and Young Link have extended grabbing capabilities (with the help of hookshots and grapling beam). However, enemies aren't the only things they can grab on to. In levels with a solid ledges (like the front of the Great Fox at Corneria), if you manage to correctly press and hold the grab button ( ) in the air, relatively close to the ledge, the characters will grab on to the ledge (either with the hookshot or grapling beam) (click here for screenshot). You need to hold on to the button, else you'll grab on but fall off. Once you have a hold of the ledge, you'll go down the length of the hookshot or grapling beam; press the button to be hauled in by your grabbing item. Blocking is quite simple in Super Smash Bros Melee. To block, press the , , or (your shield will go up after the grab animation). Also, if you want to roll left or right while blocking, press or ; however, you are very vunerable to + type attacks. In addition, SSBM allows you to dodge by pressing on the joy pad (while you are blocking). Dodging allows you completely evade an attack. Dodging can also be done in the air by pressing or .